Introducing the new AERU newsletter! 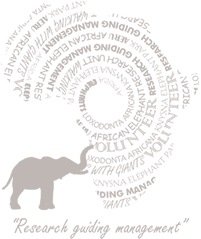 Through this quarterly publication we hope to keep you up to date with AERU activities, research programmes and fund-raising initiatives; as well as keeping you in touch with all the elephants you know and love so much! For us here at AERU, one of the biggest occasions of 2017 was the transfer of Clyde and Shaka from a captive facility into a wild reserve! Shaka has been at KEP since 2004 when he was about 3 years old . 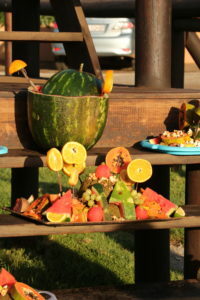 He was saved from a culling operation on a game reserve in the Mpumalanga area. Clyde arrived toward the end of 2009 as a teenager with some emotional baggage – he had been in captivity for most of his life, including in the circus, and it took time for KEP handlers to earn his trust. 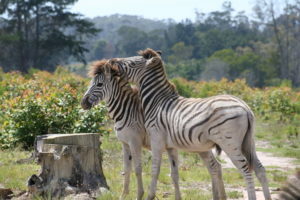 Both of these boys were initially part of the matriarchal herd, but as they grew older they were pushed out by our matriarch Sally (which naturally happens to young wild males as they grow up) and formed their own little bachelor herd. KEP took the decision to start looking for a new home for them, which was bigger and where they could have more independence. On the 5th of May 2017, Clyde and Shaka were relocated to their new home in Botlierskop Game Reserve. They were first placed in a release camp to settle in, where an AERU observation team spent a week watching them learn the meaning of ‘wild’: Clyde seemed confused at first , still waiting for humans to take him to his stable at night! 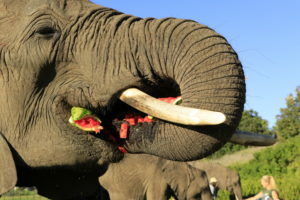 Two weeks later they were released into a vast 900-hectare area where they met the other elephants living on the reserve: 40-year-old Sam, his baby daughter Thambile, and his teenage son Chima. settled in and are loving life in Botliersko p. On one visit we spotted them deep in the valleys munching on all the food they could. On the other we were there to see a very respectful elephant greeting between Clyde and Sam, while Shaka amused himself chasing waterbuck! It is great to see that elephants who come from a captive environment can be released back into the wild with so much success – in particular Clyde. We continue to keep a close eye on them, as they settle into their new home and establish bonds with their new herd. On 5th May 2017, the same day we said goodbye to the boys, we were very fortunate to welcome three new females to our herd. Amari, Shanti and Madiwa were translocated to KEP from another facility; and for the first few weeks after their arrival, AERU kept a watchful eye on them in the orchard camp as they settled into their new environment. Towards the end of their first month, the girls were introduced to the rest of the herd. This was a slow process where for a few days a week, the two groups met briefly in the morning. 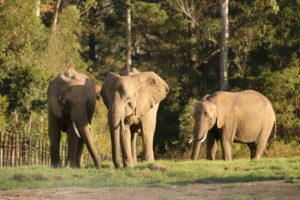 As the months passed they began t o spend longer periods of time together and now, nearly a year later, the two groups spend the whole day grazing and roaming around the Park. It has taken a lot of time and patience for these two groups to learn to trust each other, but now we are very happy to see friendships growing between the elephants. Keisha and Thato often socialise with Amari and Shanti, and Madiwa has become quite good friends with both boys! Recent research indicated a growing bond between Keisha and Madiwa. We hope to see more friendships and closer bonds form in the future, and AERU volunteers are out there recording as it all happens! One of our 2018 students will focus on these relationships – analysing how the new girls have changed the dynamics of the herd; and how social bonds are changing over time. It is a quiet and misty summer aftern oon, with very few tourists coming out to visit. After an empty tractor, Sally – a little grumpy with the lack of sweet fruits – turns back to her grazing. 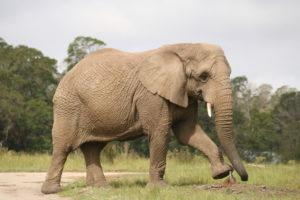 However as a browse tractor enters the field, she flares her ears and lifts her trunk to smell something, while pacing quickly towards the moving tractor and trailer, excited to sneak a juicy branch before the other elephants. Seeing her approach, the tractor moves faster and the guys on the back stand to discourage Sally from her investigation. Determined, she meets the trailer and gives it a sniff expecting something delicious – only to find it completely bare and empty. Not happy, Sally shakes her head, trumpets, flares her ears, rumbles, and streams in utter disapproval and disappointment. This is her field and she wants yummy food! A true display of a toddler tantrum. Our zebra herd is flourishing and saw five babies born during 2017 . Molo was born in January to Mica, Mbizi in July to Muriel, Ilo in November to Iris, Palesa also born in November to Poppy, and Chuma in December to Cadence. Sadly Palesa died suddenly in January 2018 from enteritis septicaemia caused by a bacterial infection in her gut. Following a post-mortem her body was donated to science at the Equine Librium College. Molo and Mbizi, being half-brothers in the same herd, have developed a very strong bond. Ilo and Chuma (also half-brothers) also have a close relationship and are often seen running around and playing together . AERU hosted two UK students for their research projects in 2017. 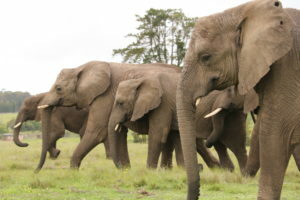 Hannah Hurt, from Bishop Burton College, played classical music to the elephants in the boma in the evenings as a form of enrichment – she is currently analysing her data to find out what impact the four ‘moods’ of music had on the elephants’ behaviour! And Megan Evans, from the University of Exeter, continued our long-term investigation into self-directed trunk behaviours, combined with the collection of saliva samples throughout the day, so that we can correlate hormone levels against behaviour on a finer scale. We didn’t quite find the pattern we were looking for, but this just means that – as is so often the case – more research is needed to get to the bottom of it! A third student, Wesley Hartmann from the University of Stellenbosch, analysed Nearest Neighbour data collected by volunteers to look at the impact of the three new elephants on the herd’s social network. He found that although there were some differences in bond strength, the fundamental structure of the herd (who is friends with whom) has not changed. In 2018, we will follow this up with another student project looking in more depth at the social impact of herd integration, and how new friendships form between the new and existing elephants. Our second new project will be looking at the behavioural impact of tourist rides no longer being offered at KEP. In the last month of rides, AERU staff and volunteers were walking alongside, recording behaviours in elephants who were being ridden. Now that rides have stopped (since 1st March 2018), we are observing how the elephants gradually respond to the change, ready for our 2018 student to collect her own data and then analyse the entire data set! O ur dung library in the lab is ever-growing with the collection of dung samples every Monday and Thursday, making sure that a full hormone record is available for any future research. Our volunteers are helping with the processing of freeze dried dung, turning it into faecal powder, which can be stored at room temperature… meaning we don’t have to ensure that dung samples remain frozen. 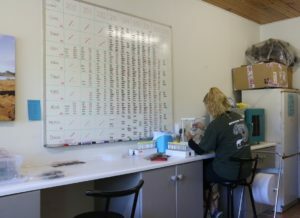 Our focus at the moment is on Keisha’s dung, measuring her hormones as part of a long-term project to understand her occasional stereotypic behaviour, which our volunteers record using fixed cameras. We have nearly finished processing the samples collected in October – December 2014, then we’ll move on to 2013. We estimate we have dried about 2000 samples, but we still have a long way to go as samples have been collected on a weekly basis since March 2010! Since January 2018, the “new girls” have been receiving enrichments in the Orchard in the evenings. They are thoroughly enjoying them – especially Shanti! 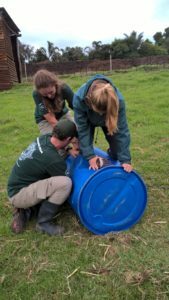 The barrels have been put to the test, they’ve been flattened and gained a few extra holes from all the fun all the elephants are having with them. We have also celebrated every birthday or holiday with enrichment events, and the new girls have also been introduced to these delicious ‘treats on a tray’. It is especially fun to see them figure out how to eat the pellet cake off the tray – they usually try to grab the whole tray or ask the volunteer to feed them the pellet cake! A Big Thank You to all of you for your generous time, funds and gifts. None of this would be possible without you!